MADISON, Wis. — From the moment the smartly-dressed Elvis Costello strode on stage Thursday night, threw his acoustic guitar over his fedora-covered head and opened his mouth before the microphone, it’s clear that aging agrees with him. This shouldn’t be a shock really. Before writing some of rock’s greatest hit singles, holding is own in several all-star collaborations and racking up more than two dozen albums, Costello was from the start an old soul trapped in the guise of a punk bookworm. But, what remains remarkable is how little a four-decades-long career has weathered his voice, his looks and his musical instincts. Audience members need only close their eyes and it wouldn’t have sounded like 32 years had passed since he last played in Madison — apart for all the new songs. 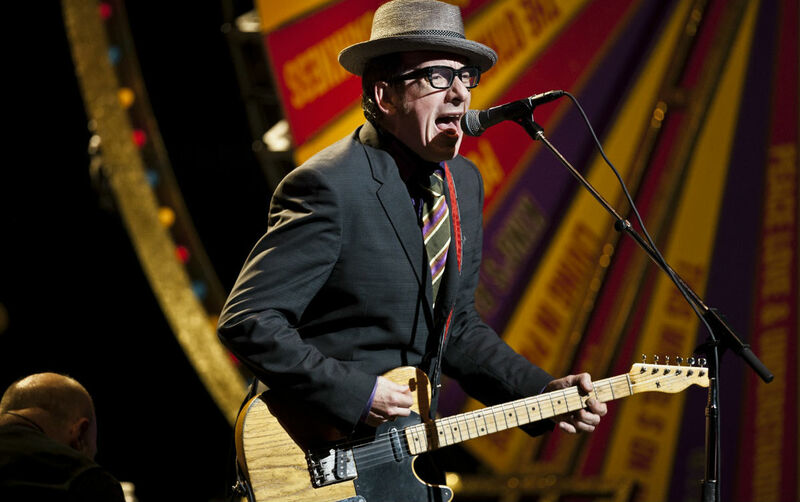 Costello’s continuing artistic vibrancy and enduring appeal were evident throughout his two-and-a-half-hour performance at the Overture Center for the Arts. It was an idea driven home with equal parts flair and precision by the singer and his three-piece backing band, the Imposters (really two-thirds of his longtime sidemen, the Attractions). These guys had the history together, but by embracing a spirit of creativity, along with those familiar melodies, they kept the wolves of nostalgia at bay. Early in the set, Costello remarked to the crowd about the passage of time and remembering a previous gig in the city in the late 1970s at defunct club, Bunky’s. “I don’t know how things have been with you in the meantime. You never did write to me,” he said, dryly. Rather than checking in, Costello’s return to Wisconsin’s capital city was just a convenient pit stop while he’s on a larger tour opening for the resuscitated Steely Dan — the Badger state date filling a gap in the itinerary. This show also allowed Costello and his bandmates to stretch out a little, play a few more deep cuts from his lengthy catalog and get in front of an audience of the already converted. “We’re going to play some songs that we don’t often get to play and some songs that you know,” he told the audience. Those songs — ditties, rockers, piano pieces, ballads — demonstrated the breadth of Costello’s eclectic musical experiences. Even during his meteoric rise in the late ’70s as the herald of New Wave, Costello had plenty of tells that he was more of a pop-music classicist than a punk-rock firebrand. If he raged onstage, it was with intensity, ambition and creative bombast instead of Johnny Rotten-approved nihilism. As the years went on, Costello proved one of pop’s most dedicated scholars and a champion for forgotten pioneers. That led him to short-term partnerships with the likes of Paul McCartney, George Jones, songsmith Burt Bacharach, jazz guitarist Bill Frisell, avant-garde producer Brian Eno, New Orleans musical godfather Allen Toussaint and most recently, the Roots. Such is Costello’s gifts as a performer and arranger that all of that material found suitable room in his Thursday night set. Rhythm was the hook that Costello utilized early on to pull in the mostly graying audience. “The River In The Reverse” had a mean, deep-in-the-pocket groove that formed a bed for keyboard genius Steve Nieve’s carnival-music runs and funky clavinet muttering, along with Costello’s vocal wail and abrasive guitar squall. It was followed immediately with the brilliant reggae strut of “Watching The Detectives.” Many of the song’s signature pieces were in place; Costello’s guitar handled the signature film-noir hook while Nieve, drummer Pete Thomas and bassist Davey Faragher (formerly of Cracker) snapped to the beat. From there though, the song, like the other cornerstones of Costello’s canon, was gently rearranged for the stage. In most cases, these alterations came across almost like Cubist interpretations of the songs in which key portions are present but lodged in new and interesting places. For “Watching,” Nieve’s organ playing answered back at every verse (a la “Like A Rolling Stone”) before the song’s extended climax when his keys conjured a monster movie anthem to collide with Costello’s discordant, live wire guitar playing. Somehow, it all fit and didn’t destroy Costello’s masterpiece. Away from the hits, album cuts like “Flutter And Wow,” “Little Triggers,” “Watch Your Step” and “I Just Don’t Know What To Do With Myself” offered many opportunities for Nieve to impress. His piano sounded stately and gospel-influenced on “Flutter And Wow” while “Watch Your Step” featured several exquisite runs before his playing turned into rapid-fire slamming on the ivories for the conclusion of “I Just Don’t Know What To Do With Myself.” This was all a warm up for what was to come. When he dove back into rock radio staples of yesteryear — “Everyday I Write The Book,” “(I Don’t Want To Go To) Chelsea” and “(The Angels Want To Wear My) Red Shoes” — Costello and the band were looking for something new. He added an echo-y guitar solo and Nieve attempted to get his keyboards to pinch hit as a horn section for the boisterous “Everyday.” “Chelsea” was even rougher and more explosive than the recorded version. “Red Shoes” was reborn as a pop gem in which Costello pulled a singalong out from the crowd and received the first standing ovation of the night. Even the over-the-top grandeur of “Lost On The River” came out much improved over what’s in iTunes. The song, created when Costello added music to a set of old Bob Dylan lyrics, grew in stature as a bluesy waltz with the Imposters than when it was recorded with supergroup the New Basement Tapes last year. When Costello wasn’t singing, he looked like a throwback. He was the consummate entertainer — both with his patter on the microphone and his demeanor. Costello still rivals Jack White as rock’s best-dressed gangster and on this evening, he looked like a bebop-era pool shark in a dark blue suit and white fedora. When coming or going from the spotlight, his mannerisms were odd. His hands were outstretched and gestured awkwardly like Mike Myers’ Austin Powers. Meanwhile, his repartee with the audience was fodder for comedy writers as he took amusing digs at Donald Trump, the British royal family and himself when sharing anecdotes about how various songs came into being. The absolute highlight of the concert came when Costello returned from the shadows once again and he proceeded to perform a wonderfully stripped-back “Alison” with only his acoustic guitar and without a microphone. In the ultimate unplugged moment, Costello offered a revelation. Gently strumming the guitar strings with his thumb, Costello exhibited his own musicality, the full might of his voice and the powerful emotion packed into one of his greatest songs. As the full band returned, fans were reminded that this wasn’t vaudeville, this was a rock show. And from then on, Costello and company were playing to get across the goal line. “I Hope You’re Happy Now” was a Beatle beat stomper that was followed by more high-energy numbers, “High Fidelity” and “Brilliant Mistake,” that had crowd on their feet. When it comes to a set closer, few performers could call up two better rock ‘n’ roll rallying cries than “Pump It Up” and Costello’s famous cover of “(What’s So Funny ‘About) Peace, Love And Understanding.” If some fans could be heard joking before the concert’s start that this was a “geriatric set” because of the early start time and the preponderance of gray hair among the audience, the thudding beat of “Pump It Up” instantly brought back the vitality of youth. The Imposters took their time revving the audience up with the rhythm, channeling both the Spencer Davis Group and the Velvet Underground, before kicking into Costello’s locomotive wordplay and brittle guitar strumming. Seguing into the powerhouse “Peace, Love And Understanding” had Costello and the group pulling out all the stops and offered compelling testimony that rock isn’t a young person’s game. While Costello would likely love for his audience to see him as a peer to the veteran performers whom he lionizes, this performance made one fact very clear: This is one act that hasn’t yet gotten old. Tags: Bunky's, concert, Elvis Costello, Imposters, Madison, Overture Center, Overture Center of the Arts, Pete Thomas, review, Steve Nieve, Thursday, Wisconsin. Bookmark the permalink.